Pictured Above (from left to right): Peter Mannino, Director of Coaching; Zoe Verdensky; Kyle Clinton, Head Coach CLW G2000 Select team; Delaney Lynch; and Ed Lynch, CLW Girls Technical Director. National Signing Day, usually held on the first Wednesday of February, has traditionally been the first day that a high school senior can sign a binding National Letter of Intent for a collegiate sport with a school that is a member of the United States National Collegiate Athletic Association (NCAA). It is an exciting time for every high school senior that has the ability and chooses to continue to play their sport in college. Some college offers were made prior to this year's Signing Day (2/7/18). Some are still in process and will be finalized soon. The initial list below are those that completed their signing on February 7th and the list will continue to grow as we hear about the great news with other players. GO CHARGERS!! 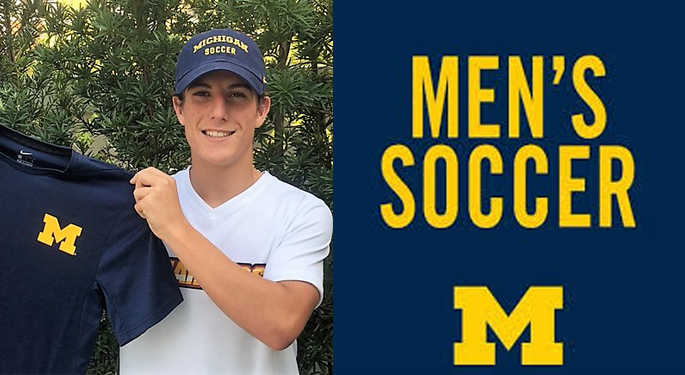 Harrison Pithers (Development Academy U-19 Team) commits to University of Michigan. (Go Wolverines!) CLICK HERE for a full story.